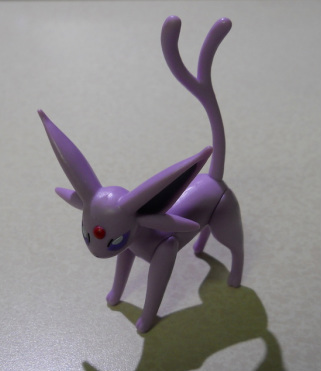 Eevee, a first generation Pokemon, got Umbreon and Espeon as new evolutions in the second generation. Eevee evolves into Umbreon when his happiness is maxed out at night, and Espeon when his happiness is maxed out during the day. To further support them as being "opposites," Umbreon has excellent defensive stats while Espeon excels in her Special Attack stat. Interestingly enough, Umbreon is in the Overused tier (though just barely) thanks to his defensive stats supporting Baton Pass, while Espeon is in the Never Used tier (very likely due to her limited movepool and just being outclassed by other Psychic-type Pokemon). Eeveelutions (Eevee and all seven of his evolutions) have quite possibly the largest fanbase out of any Pokemon as far as collecting goes, so their merchandise tend to run on the extremely plentiful and costly side. 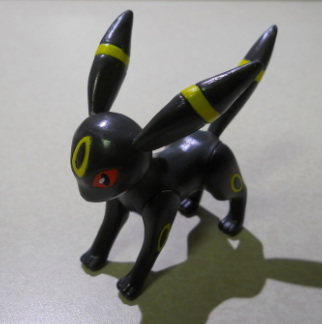 Because of this, I consider myself to be a very casual Umbreon and Espeon collector. Ever since the first time I saw the official illustrations of Umbreon and Espeon, I have always thought of them as a very cute couple (dark and mysterious Umbreon being a guy, dainty Espeon being a girl). I also love them for representing night and day, and for being black and purple (two of my favorite colors).